It seems like some folks missed it but in my May 2011 Google Webmaster Report I spoke about some webmasters and SEOs asking if Google was updating the Panda algorithm once more. Some were coining this update Panda 3.0 or 2.1. 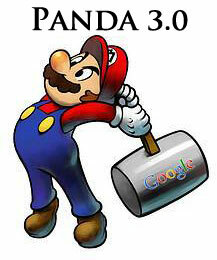 There are many SEOs and Webmasters at WebmasterWorld discussing this update to Panda. Google did not confirm any Panda update but it seems like many webmasters are suggesting this is the 3rd major update to Panda. The first one was Panda released in February and then the international rollout in April, where some SEOs saw incremental returns. And now, early May, webmasters and SEOs are saying Panda has shifted a bit. Is it possible that Panda 3.0 just rolled out (as of May 6, 2011)? Perhaps it's in the process of rolling out? I'm seeing a massive shake up in the search niches that I monitor, results are bouncing all over the place. My websites seem to be slipping again to a new all time Google referral low. In the ongoing WebmasterWorld thread, people are talking about two shifts to this Panda 3.0 update. Anyway, if you are seeing similar changes, you may want to check out the threads. Update: This is official, well not the 3.0, but as Danny put it, Panda 2.1 with a very small update to the Panda algorithm released around this time. Previous story: NY Times Hates Google Or Just Simple Reporting?